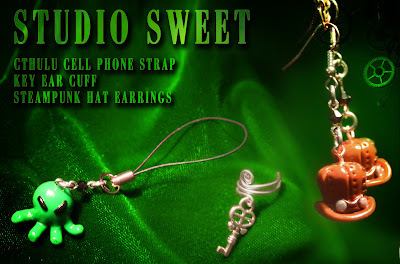 Studio Sweet provides a great variety of polymer clay work along with excellent chainmaille and jewelry! I cannot get over how awesome the little steampunk hats with goggle earrings came out, and she is just getting started on some of her steampunk creations! Cthulhu lovers unite, check out her Cthulhu and Mrs. Cthulhu pieces on her facebook page. While normally focusing on anime and game related material she is branching out, and excellently, into the steampunk and HP Lovecraft pieces. Jen Sweet, owner of Studio Sweet is located in San Antonio. Jen makes handmade jewelry out of chanmail and charms out of polymer clay. Her charms are mostly video game, anime, and comic inspired and can be added to necklaces, bracelets, earrings, keychains, cell phone straps, bookmarks, etc. Watch her updates for more Steampunk geared chainmaille pieces as well. I am really excited to see how she develops the new pieces. I had a sneak peek of some earrings that looked perfect. Studio Sweet will be vending at Anime Matsuri in Houston, TX! Studio Sweet will also be attending The Helotes Market Days in May. 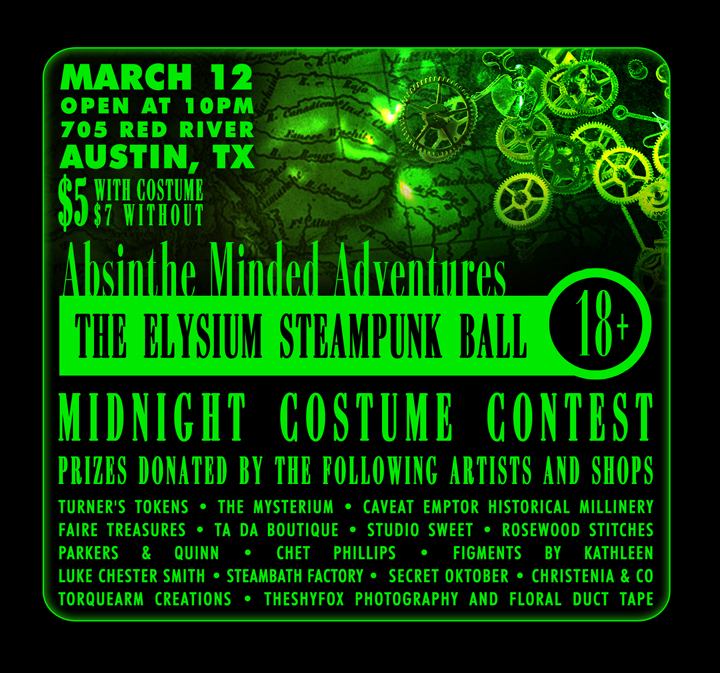 Grab your goggles and lace up your corsets! 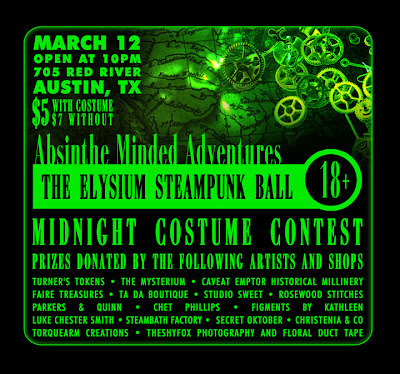 March 12th the Elysium Nightclub is hosting a Steampunk Ball! Ages 18+. Open @ 10pm. Performance by Emperor Norton's Stationary Marching Band before the Midnight Costume Contest and Giveaways! Costume Contest Loot Donations provided by the following shops and more! What are the costume contest categories? The Elysium is NOW 18+ on Saturdays!